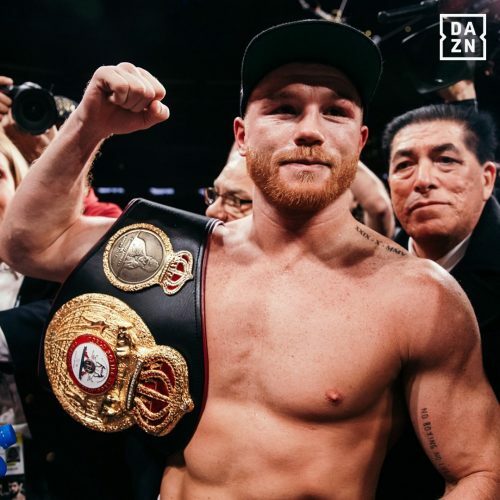 FIRST ORIGINAL EPISODIC PROGRAMMING ON DAZN IN THE U.S.
London, 6 December 2018 – As the sports world prepares for the Dec. 15 super middleweight championship fight between Canelo Alvarez and Rocky Fielding at Madison Square Garden, DAZN will introduce its first original episodic program, CANELO V ROCKY. The show will bring fight fans behind the scenes as both fighters prepare for this historic event. The series premiere will debut on DAZN’s platform and YouTube channel on Thursday, Dec. 6. Increasing the program’s reach to more than 75 million households around the United States, linear airings of CANELO V ROCKY will begin Friday, Dec. 7 on regional sports networks including NBC Sports, Fox Sports, MSG Network and NESN via the Fight Sports block. The series will also appear in Spanish on Univision Deportes. Fans can check local listings for start times. Executive produced by Jason Bowers and Grant Best, CANELO V ROCKY will be narrated by bilingual film and television star Jaime Camil. Created by Emmy Award-winning producers, CANELO V ROCKY will be embedded inside the lives of both prize fighters as they grind through their respective training camps. The fight on Dec. 15 marks new territory for both fighters. Pound-for-pound superstar Canelo Alvarez (50-1-2, 34 KOs) will move up to the super middleweight division for the fight time in his 13-year professional career, seeking to win a title in his third weight division. This 168-pound showdown will also be Canelo’s first fight at the historic Madison Square Garden. Fighting out of Liverpool, England, Rocky Fielding (27-1, 15 KOs), who at six-foot-one towers over the Mexican champion, will risk his super middleweight title against Canelo, as he looks to spring a monumental upset in his first fight on American soil.